It was perfect, we had the five course surprise menu with accompanying wine. 3 out of 4 were with red wine (because red meat), it would have perhaps been nice if there were two with white wine but not a complaint really, as the dishes were really nice. Something went wrong in the kitchen so one dish took a bit longer, we were so comfy we did not notice but pro-actively they offered an additional glass of wine. Price is also very good, i.e. good price/quality ratio. Er choose the surprise Menue with 4 courses and it was a perfect surprise. We enjoyed our stay and it was a beautiful evening. Thanks for all!! Had the 5-course chef-special, it was OK except for the pigeon dish (tasted like lever already and was a bit too tough). Could be because it is located in the old part of town, the smell in the restaurant was not pleasant (whenever the door of the loo is opened, there seemed to be a stronger tide of it). If this problem could be fixed, it could be a place to go for dinners for two or no mor than four. We had an amazing time and the kitchen is very inventive. Highly recommended, a bit pricy but worth it! Very cozy and good food! Good food let down by appalling service . Service was slow and very unattentive and the wait for drinks and food interminable. With a girlfriend visit Goedheyd on Sat for dinner. This is my 3rd time to visit them and the quality is still good. The service is friendly, attend. The explanation of the wine and dish is very clear and the combination is very good. It is almost full-house on Sat evening, if the food is not good i don't think they will be fully booked. The price compared to quality and taste balance well. I would like to visit them again with friend or family shortly. Absolutely amazing food and service! This is a superb restaurant. There was not one flaw in anything; the dishes were prepared with the highest quality ingredients and executed with great precision and imagination, the service was wonderful, warm, inviting, the atmosphere beautiful. 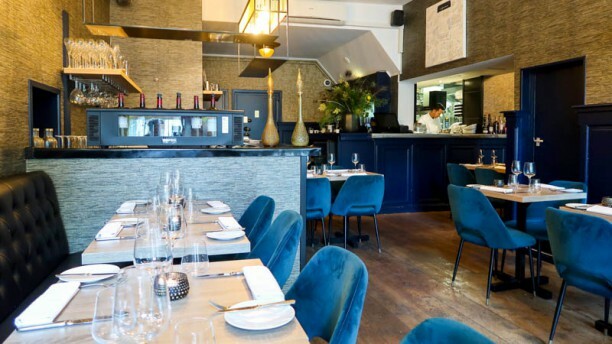 It's not a bistrot (there are no home-food dishes on the menu) or a brasserie (there is much greater precision in the kitchen than what a brasserie requires), it's a small restaurant with an expert chef and crew. Altijd heerlijk en gezellig! Mooie wijnen en ster kwaliteit Wagyu. Erg bijzondere smaken, goed over nagedacht! The restaurant itself is cosy and a perfect place for a romantic or family dinner. We had a fantastic meal here. We had the 4 course surprise menu, with wine pairings. The timings of the courses were great, plenty of time in between to chat and enjoy the wine. The waiter explained the wines in an interesting, relevant and unpretentious manner. We felt very looked after. The food itself was interesting without being crazy, perfectly cooked and delicious. Well worth the money for a treat.